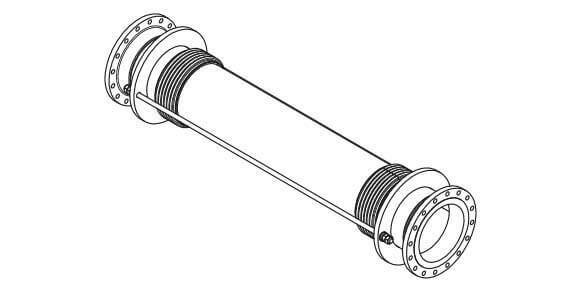 We provide a comprehensive range of stainless steel expansion joints for tank farm applications. Tank Farm Bellows are specially designed as a flexible connection between storage tanks and manifolds absorbing movements due to tank settlement. Tank Farm Bellows look like standard expansion joints, but they are specially designed for this particular application which requires a high reliability during the entire service life of the storage tank. Diameter, installation length and design criteria of the Tank Farm Bellows can be changed upon customer’s request and are available in all sizes up to DN 12.000, all designs and all materials. Materials: Bellow elements and inner sleeve from Incoloy 825, which offers superb resistance against corrosion. Steel parts such as flanges, pipe ends and middle pipes are made from ASME materials such as A105, A106 Gr.B. The Tank Farm Bellows comply with PED/CE. If required, the Tank Farm Bellows can be designed and calculated according to EJMA, ASME, EN and AD2000. The Tank Farm Bellows are delivered with fabrication book, declaration of conformity (DOC) and user guide. As a full NDE has been carried out in our workshop, no additional on-site tests are required and the Tank Farm Bellows are ready to install. We hold all necessary approvals and type approvals for supplying to the oil & gas industries such as EN ISO 9001, PED, EN 3834-2, AD2000 and type approvals by Bureau Veritas, Lloyd’s Register, DNV-GL. We are familiar with working with applied design codes and standards such as; PED, NORSOK, ASME, EJMA etc. As we are often involved in projects, where expansion joints are a part of a critical application, we understand the importance of the supporting documentation. Firstly, the provided specifications are studied and a close dialogue with the client begins. Following which we produce the detailed quotation, supporting calculations, complemented by extensive quality control and testing procedures as a part of the project documentation. Additional to this is the inspection of welding consumables, materials and a sub-supplies audit, test, documentation and final inspection. A Dutch refinery wanted to reduce unwanted spills and sought a more reliable, flexible connection between their storage tanks and manifolds.